Are You Committed to Dance Organizing? Then our special Dance Organizers Course is for you. 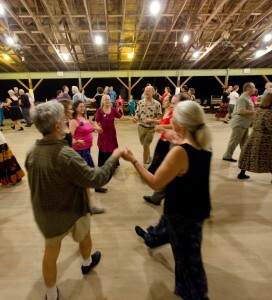 Led by Gaye Fifer and held during CDSS’s English & American Dance Week at Pinewoods (EAP), August 23-30, 2014, the course is designed for people involved in organizing their home dance community—contra, square, English, adult or family. Two one-hour sessions will be held each afternoon to discuss and strategize about issues that affect local dances. Sharing, questioning, collaborating and connecting will be our watchwords as we interview guest speakers from the EAP staff, create solutions to problems, brainstorm, practice and give feedback. We’ll create a network of support and a toolkit of ideas that each participant can take home. You’ll have fun, learn a lot and your local community will benefit. And for the rest of the day and evening, the wonderful resources of English & American Dance Week are yours. If you know people in your community who are “up and coming” leaders, send them this message and link; the course is also useful to people wanting to start a dance. Scholarship help is still available. Ready to join in the organizing? Register here. Course leader Gaye Fifer has been calling at dance weekends for many years. Her pleasant style and graceful teaching put dancers at ease and set the stage for a great dance experience. She has also taught numerous waltz workshops at virtually every dance weekend in the East and travels whenever she gets the opportunity. Gaye has a passionate interest in organizing to support dance community leaders and organizers. Pinewoods Camp, near Plymouth, MA, and home to the Country Dance and Song Society’s programs since 1933, is a beautiful setting, creating a retreat where you can immerse yourself in nature, music and dance; see a slideshow of the facility. The Country Dance and Song Society is a traditional dance and music organization, celebrating its Centennial in 2015. This entry was posted in American Dance, Arts Advocacy, Beginning Dancers, Camps & Programs, Contra Dance, Dance Callers, Display Dance, English Dance, Features & Fun, Folk Dance, Musicians, Old Time Dance, Round Dance, Square Dance, Traditional Dance, Traditional Music on May 22, 2014 by Lynn Nichols. Contra Dancing in Mexico—The Adventure Begins! Dugan Murphy on Techno, Gender-free, and Bluesy Contras: Evolving Tradition?